Tue., 4 Jun. - Sat., 15 Jun. Tue., 18 Jun. - Fri., 28 Jun. Tue., 10 Sep. - Tue., 10 Sep.
Wed., 26 Jun. - Thu., 4 Jul. Thu., 18 Jul. - Mon., 5 Aug. Tue., 7 May - Wed., 15 Jan. Sun., 6 Oct. - Fri., 11 Oct.
Wed., 19 Jun. - Fri., 28 Jun. Sun., 27 Oct. - Tue., 5 Nov.
Wed., 30 Oct. - Sun., 15 Dec.
Fri., 10 Jan. - Sun., 19 Jan.
See all 491 properties in Tampa Intl. 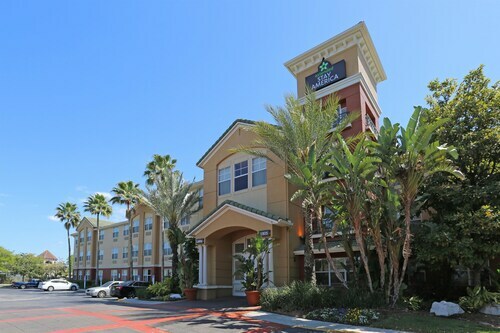 Centrally located near restaurants, bars, and movie theaters, this hotel is within 2 miles of the Tampa airport, and 5 miles from both downtown Tampa and The Florida Aquarium. Located in Tampa International Airport, this Marriott hotel is less than fifteen minutes from Raymond James Stadium and International Plaza shopping. The Tampa Convention Center is within a half-hour's drive. 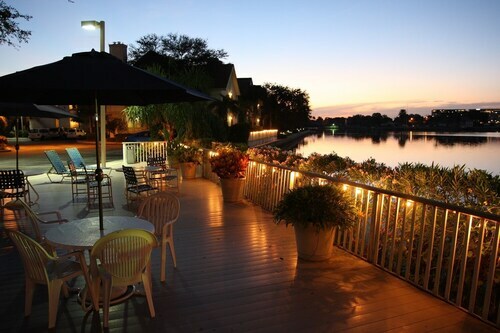 Overlooking Upper Tampa Bay, this waterfront conference hotel offers visitors a beautiful natural setting 1 mile from the Rocky Point Golf Club and 2 miles from Tampa International Airport. 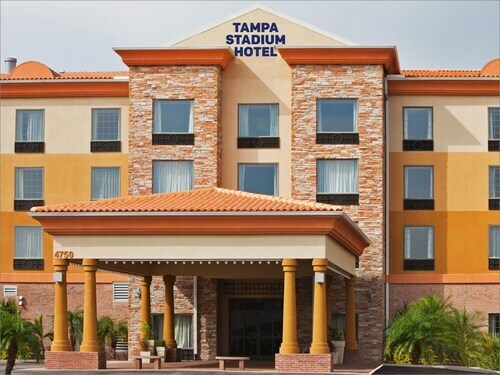 Located less than a mile from the Tampa Airport, this hotel is across the street from the Tampa International Mall and less than 2 miles from Raymond James Stadium. Situated on the waterfront, this aparthotel is 2.8 mi (4.5 km) from Rocky Point Golf Course and 2.8 mi (4.5 km) from Cypress Point Park. Raymond James Stadium and Westshore Plaza Mall are also within 6 mi (10 km). Situated near the airport, this hotel is 0.9 mi (1.4 km) from Rocky Point Golf Course and 3 mi (4.9 km) from Cypress Point Park. Raymond James Stadium and Westshore Plaza Mall are also within 6 mi (10 km). 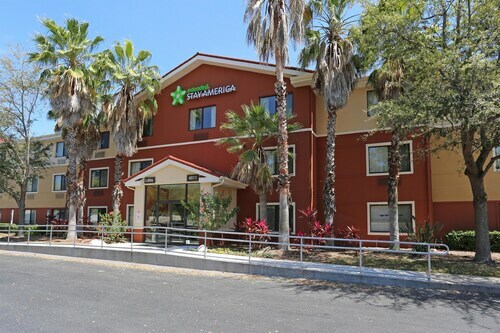 Situated near the airport, this hotel is within 1 mi (2 km) of Laser Spine Institute, International Plaza and Bay Street, and Westshore Plaza Mall. Raymond James Stadium and George M. Steinbrenner Field are also within 3 mi (5 km). 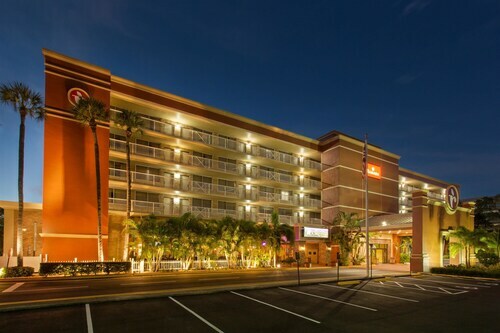 Situated near the airport, this hotel is within 3 mi (5 km) of Raymond James Stadium, George M. Steinbrenner Field, and International Plaza and Bay Street. Al Lopez Park and Cigar City Brewery are also within 3 mi (5 km). Question : How much is a plane ticket to Tampa (TPA) from Halifax (YHZ)? Answer : Cost can range from $425 to $1,627, prices for YHZ to TPA do fluctuate more than most routes from Canada. Prices are usually less the further out you book. Question : How long is the flight from YHZ to TPA? Answer : This direct flight will rush you away to your destination in four hours and 16 minutes via WestJet. If you catch the 6:15 PM ADT departure, you'll arrive at 9:31 PM EDT. Allowing you plenty of time to freshen up or grab a quick lunch (don't forget, there is a time change of one hour). Question : What is the cheapest airline flying from Halifax to Tampa? Answer : United Airlines is the leader in keeping costs low for their passengers over the next three months. Bookings are being made at just $425, which is a great deal when compared to the high-end bookings of $1,627. Answer : The cheapest day to fly from Halifax to Tampa is on Tuesday. If you would like to save a little cash on your next business trip look for flights on that day. Question : How many flights are there per day from Halifax to Tampa? Answer : The number of flight times varies by day, but on average, YHZ to TPA sees only one option. The average route departing Canada currently has six different flight times per day, so expect fewer options than you're used to. Question : How long does it take to fly from Halifax to Tampa? Answer : This flight takes about four hours and 16 minutes via WestJet. If you catch the 6:15 PM ADT departure, you'll arrive at 9:31 PM EDT (remember, there is a one hour time change). Question : How much time do people spend in Tampa? Answer : The average time spent in Tampa by travellers from Halifax is about one week. We booked 2 tickets together and our seating was 8 rows apart :( However, the wonderful lady at the counter at check in, got us seated back together. Thank you! My husband got sick and missed the flight. Wonder if there is anything I can do about that. I found the flight wonderful and hassle free. Would certainly fly west jet again ! Did not friend the ground staff in the baggage area nice at all, not friendly or helpful. All the other staff were wonderful as always! early morning flight so when we arrived nothing was open and had to wait to check luggage, and then agin to go through customs. The staff on that flight were magnificent! Their service and interaction with passengers was outstanding. They should be recognized for their extra effort! They made this the best flight that I have ever experienced! Please take the time to recognize them individually! They represent your airline so well. Direct flight and price were my reasons for booking with WestJet and very pleased with the experience so far. I bought round trip tickets so will be returning in a week.